LAST year when the Chhattisgarh government announced health insurance scheme for people above the poverty line (APL), it was touted as an initiative to improve healthcare delivery in the state. But within a few months of introducing it, Mukhyamantri Swasthya Bima Yojana (MSBY) has turned out to be a political gimmick to capure the vote bank as the government faces elections in October-November. The state launched MSBY on the lines of the Centre’s Rastriya Swasthya Bima Yojana (RSBY), which caters to people below the poverty line (BPL). It provides cover for hospitalisation cost up to Rs 30,000 for a family of five on floater basis. The state has roped in the 350 private hospitals under RSBY for its MSBY scheme. But the hospitals are not willing to admit APL patients under the scheme, saying the insurance amount is too less. Like RSBY, MSBY sets down the amount a hospital can charge for the treatment of a particular disease. For example, hospitals under the scheme can charge Rs 3,500 for treating pneumonia or malaria and Rs 9,500 for jaundice. The private hospital authorities say they treat BPL patients at such low rates as a welfare scheme. It would be difficult to provide the care to all at such low fees. Ajay Sahay, president of the Chhattisgarh chapter of Indian Medical Association (IMA), says, “We have informed the government about our demands to increase the insurance amount to somewhere between Rs 1.5 lakh and Rs 2 lakh.” On April 4, a group of private hospital authorities held a meeting with the state’s health minister, principal secretary and other government officials to discuss their grievance. “Instead of proper solution, they proposed increasing the cost of one treatment and reduce that of the other. They also said that we would have to treat MSBY beneficiaries, if we want to treat people under RSBY,” says Sahay. “We are now left with no option except refusing BPL patients as well.” Sahay alleges that the government did not consult the private health sector while planning MSBY, but now it wants the sector to implement the scheme before the elections. In December last year, the Chhattisgarh government had tried to outsource diagnostic facilities for government hospitals to strengthen its public healthcare system. But no private party showed interest to provide diagnostic facilities in remote areas of the state. “It is not strange or unexpected,” says T Sundararaman, executive director of National Health Systems Resource Centre, a technical support institution with the National Rural Health Mission. Private sector works for the maximum margin and is demanding just that, he adds. But increasing the insurance amount is not the solution, Sundararaman says, citing the example of Andhra Pradesh, where the private health sector is demanding an increase in the insurance amount from the existing Rs 1.5 lakh. Private hospitals in Andhra Pradesh have threatened to discontinue providing treatment under Rajiv Arogyasri scheme for BPL category from May 3 if their demands are not met. Every year about 200,000 patients undergo surgery under the scheme for 938 listed diseases. B Bhaskar Rao, president of Andhra Pradesh Specialty Hospitals Association (ASHA) says the government launched the scheme six years ago. 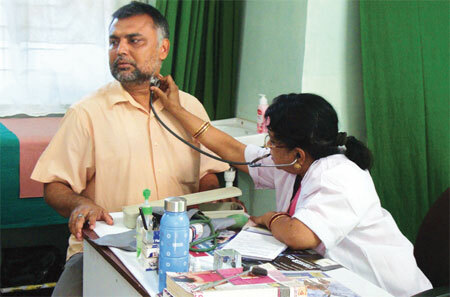 But there has been no hike in the amount despite requests by the private doctors’ association. “We demand that the government raise the insurance amount by 30 per cent and thereafter increase it by 5 per cent every year,” says Rao. Budget 2013-14: provisioning for universal healthcare or moving away from agenda?